The fully loaded SL Platinum AWD model we tested (base priced $37,398) ups the ante with 19 Inch alloy wheels, PRO PILOT Assist, steering assist, automatic climate control, fog lights, power sunroof, trailer hitch pre-wiring, navigation system with Around View Monitor, Intelligent Key with pushbutton start, auto up/down driver’s window, auto-dimming Rear-view mirror, illuminated vanity mirrors, dual-level console tray, luggage side hooks, cargo light, six-way power driver’s seat, leather upholstery and fold-flat front passenger seat. Our tester also came with intelligent cruise control, lane departure warning, blind spot warning, and rear cross traffic alert, lane departure prevention, forward emergency gracing, pedestrian detection, high beam headlights and 4 way power passenger seats, and much more. 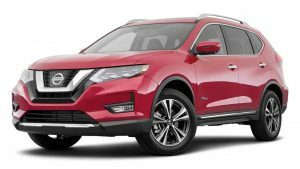 In addition Nissan equips the Rogue with the full suite of safety features, including an antiskid system, traction control, four-wheel disc brakes a with antilock and airbags all around (front, side and overhead). Small but useful standard features include a trip computer integrated with readout for average fuel consumption, average speed, and elapsed time and outside temperature. Cruise control and steering wheel controls are also standard on all Rogues. For hauling cargo, the rear 60/40-split/fold bench seat is standard the refined, speed sensitive power steering offer good confident handling. In fact, the steering is much tighter and more precise than the previous model. In terms of the AWD system, it uses a 70/30-power split with an AWD Lock option that turns off when you exceed 40km/hr. Of note is Nissan new PRO PILOT assist safety and semi-autonomous driving function system. Fuel economy is rated at 9.6 l.100km in the city and 7.54 l/100km on the highway. Other competitors in this class are roomier, but in- vehicle storage is fine and the Rogue just look better, and feels more “together” and classy. It is also more fun to drive. In the market for a SUV or CUV with personality? The Rogue fits the bill nicely.